Baghdad, Iraq (CNN) -- Iraqi Prime Minister Nuri al-Maliki canceled a planned meeting with visiting U.S. Defense Secretary Robert Gates on Thursday after being summoned by Iraqi lawmakers to discuss a huge bombing in the capital earlier this week. Gates did not consider the missed meeting a "snub," his spokesman said, but called off a planned news briefing as a result. "The prime minister has to be accountable to the legislature, especially in wake of this type of attack, and the secretary looks forward to rescheduling the meeting -- hopefully tomorrow," Pentagon spokesman Geoff Morrell said, according to a pool report. At least 127 people died in a string of five suicide car bombings in Baghdad on Tuesday, and 448 were wounded. A group linked to al Qaeda said it carried out the attacks. "The bombings are a tragic reminder it's not over yet. There is still work to be done. And this fight has to be carried out on a continuing basis," Gates told Iraqi President Jalal Talabani and the presidential council, according to Morrell. Reporters were not allowed into the meeting. The defense secretary arrived in Iraq on Thursday after a two-day trip to Afghanistan. There, Gates told Afghan soldiers that America will maintain a presence in their country beyond the troop pullout set to begin in 2011. 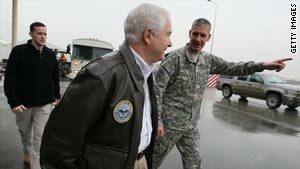 "While we hope to transfer power in July 2011, we will have a large number of forces here for some time beyond that," Gates told the group at Kabul airport. "This is the first time in Afghan history when foreign forces are here to help, and we intend to be your partner for a long time." Gates called the relationship between the two countries one "forged in blood" because of the heavy casualties that American and Afghan troops have suffered while battling a resurgent Taliban. "We recognize your challenges," he said. "Our troops have made sacrifices also. So this is a relationship forged in blood. We will see it through together." Afghan officials thanked Gates for President Obama's new plan for Afghanistan, which involves the deployment of an additional 30,000 U.S. troops. They also expressed relief about Gates' pledge for troops to stay beyond 2011.